As a trainer, Dana’s aims to provide students with the resources they need to improve the lives of their dogs. She believes training is essential to maintaining balance in a dog’s life. Dana has extensive experience in caring for animals; she ran her own dog-walking and dog-sitting business before becoming a certified dog trainer. 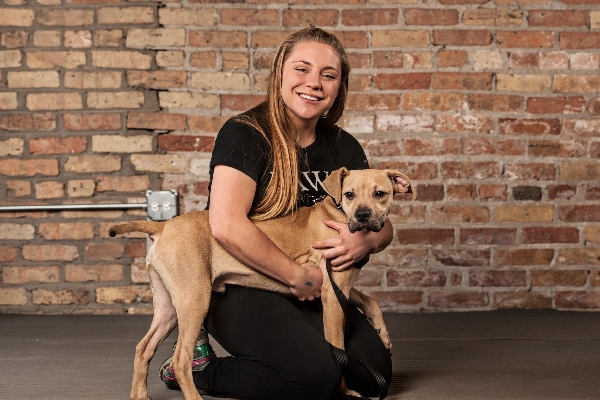 Dana’s passion for helping animals inspired her to join the PAWS Chicago team full time as Foster Coordinator. She is responsible for helping our long-term resident dogs be successful in their foster homes. This includes conducting training classes and providing enrichment and behavior modification and management. Dana’s dogs: Dana shares her life with her bully breed puppy, Mac, whom she recently adopted from PAWS Chicago. In addition to a solid obedience foundation, she plans to train him in agility and K9 Nosework at PAWS Chicago. Fun fact: Dana loves to play soccer, a sport in which she has competed for the majority of her life. Have a question about Training Classes?